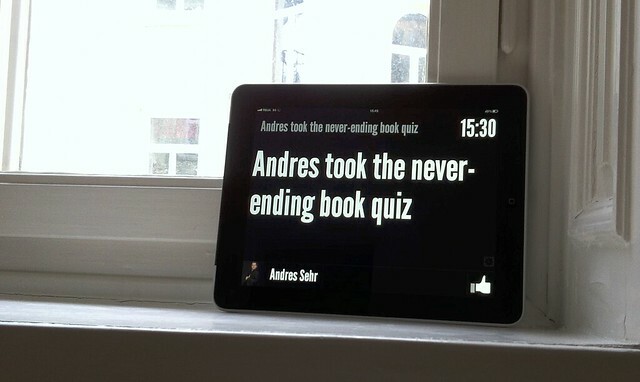 This weekend’s hack is an iPad app which displays your Facebook news feed in a “photo frame” fashion — large text, automatic, simplistic and suitable for passive viewing. I never really got the iPad (my laptop or smartphone is always around) and have probably used it for about a total of 10 hours, so better make good use of the thing. The app is actually a web app. iOS web apps are perfect for these simple hacks as no super-mega performance is required and the hassle of getting a native app on the App Store would yield more work than actually building the app. 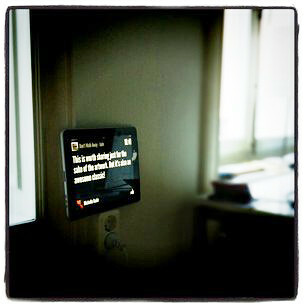 Visit rsms.me/projects/fnews in your iPad, add the app to your Home Screen and start it. It’s built on the Facebook Graph API which provides a smooth and low-barrier user experience. The streaming/real-time API does not currently support news feed, thus a polling techinque is used instead. This works really well with a polling interval of around 1 minute. The “like” button is unfortunately somewhat defunct as the only API for “like” is the Open Graph one which causes the app to like something rather than the user. Update: I’ve added a request for the publish_stream permission. If you already have connected Fnews with Facebook, you’ll need to log out (tap the hard-to-see gear in the bottom-right corner) and then log in again to give Fnews the rights to “like” something on your behalf. I really wish there was a separate publish_like permission as publish_stream sounds really scary to most users and will probably lower the user count. Anyhow, “Like” to the people!. Foursquare check-ins use maps from Google Maps (the Static Map API) rather than Foursquare as their (Foursquare’s) API is too complex for this quick hack. Google Maps are prettier anyway. I never managed to “snapshot” any Gowalla check-ins during the weekend (they are relatively rare in my perspective), so currently no Gowalla “candy additions”. Instagram pictures turned out to be rather simple to acquire as they provide a simpler “embedding” API — in addition to their full-blown OAuthed behemoth API — which allows to simply concatenate a regular link URL with “media” to build a higher-res image URL. Neat.